Much of Ron Lee’s working life was spent helping to build Country Coach’s business. 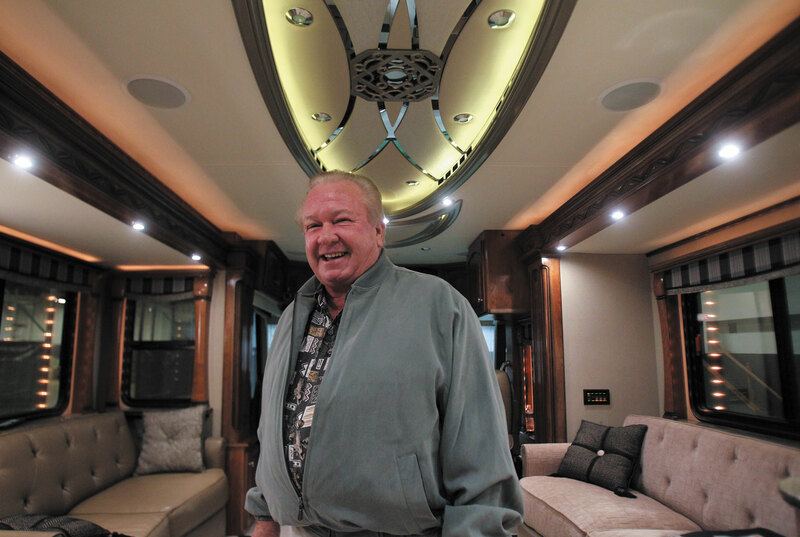 Ron Lee, who helped grow Country Coach into one of the top luxury motorhome manufacturers, died January 19, 2019. He was 76. In 1975, Mr. Lee began working at Country Camper, a fledgling RV manufacturer that his brother Bob had cofounded. The business, based in Junction City, Oregon, became Country Coach Inc. and grew under the Lee family’s leadership to employ more than 1,500 workers. Ron Lee held the title of vice president/production manager. National RV Holdings bought Country Coach in 1996, and in 2009 National RV declared bankruptcy. The following year, Ron Lee came out of retirement and bought Country Coach’s assets and intellectual property. Mr. Lee brought together a team that provided service and parts for Country Coach vehicles. In late 2015, Country Coach Corporation was sold to Winnebago Industries Inc.
One of the largest known collections of scale-model camping replicas from around the world has found a home at the RV/MH Hall of Fame and Museum in Elkhart, Indiana. The donor is Randy Rusk of Fort Wayne, Indiana. Mr. Rusk has been acquiring models since age 9. Over time, his collection of miniature campers, motorhomes, and manufactured homes grew too large to display at home. As he and his wife neared an empty-nest transition and made plans to downsize, Mr. Rusk didn’t feel right about selling his treasures. “The RV/MH museum seemed like the perfect destination for my cherished collection,” he said. The General RV Clarkston Supercenter, about 40 miles northwest of Detroit, Michigan, opened in late January 2019. It is five times larger than General RV’s White Lake/Waterford store, which it replaced. The new 20-acre facility has about 300 RVs on the lot, 16 service bays, and a large retail space. It is located at 8665 Dixie Highway, off Interstate 75. For more information, call (888) 436-7578 or visit www.generalrv.com. Towable manufacturer K.Z. Inc. has introduced the Sportsmen SE, an entry-level version of its popular Sportsmen LE line of travel trailers. With unloaded vehicle weights ranging from 4,300 pounds to 6,100 pounds, the Sportsmen SE is geared toward the SUV or half-ton pickup truck market. 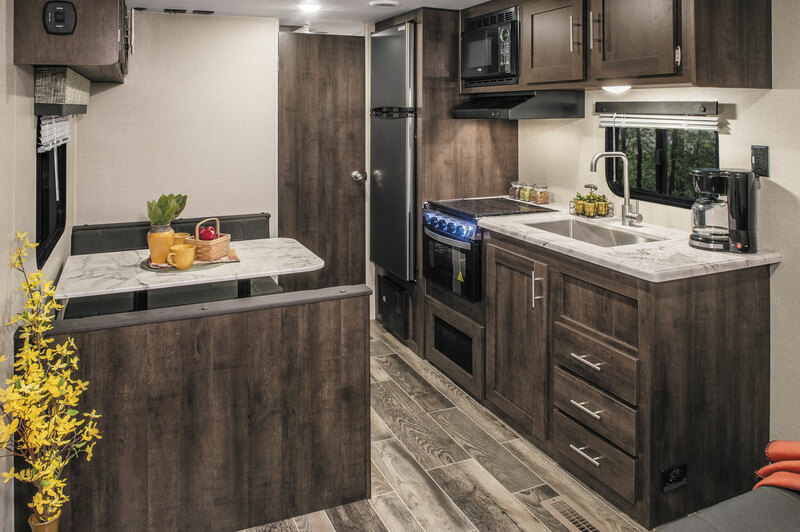 Features of K.Z.’s Sportsmen SE include residential-grade vinyl flooring, a 10-cubic-foot 12-volt refrigerator, and a drop-in cooktop with a glass cover. Standard features of the Sportsmen SE include a power awning with an LED light strip; outdoor speakers with LED lights; a spare tire and carrier; and residential-grade vinyl flooring. In addition, the RV comes with a drop-in cooktop with a glass cover; a built-in oven; a 10-cubic-foot 12-volt refrigerator; and a multimedia stereo. The Sportsmen SE has three options: an upgraded air conditioner; an outdoor kitchen; and a 7-cubic-foot gas/electric refrigerator. For more information, call (888) 829-6320 or visit www.kz-rv.com. The RVBusiness “RV of the Year Award” TV show, taped November 29, 2018, at the RV/MH Hall of Fame and produced by Rollin’ On TV (ROTV), is available for viewing. 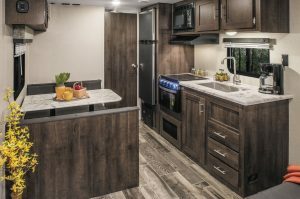 The program showcases the 2019 RVBusiness RV of the Year, Forest River Inc.’s Vengeance Touring Edition 385FKS fifth-wheel toy hauler. Four finalists also are featured: inTech RV’s Sol travel trailer; the Leisure Travel Vans Wonder RTB motorhome; Thor Motor Coach’s Omni/Magnitude Super C motorhome; and Winnebago’s Micro Minnie 2405RG fifth-wheel. The show can be seen online at https://rollinontv.com/rvbusiness-rv-of-the-year-award-show; on rvbusiness.com; and on YouTube and Vimeo. 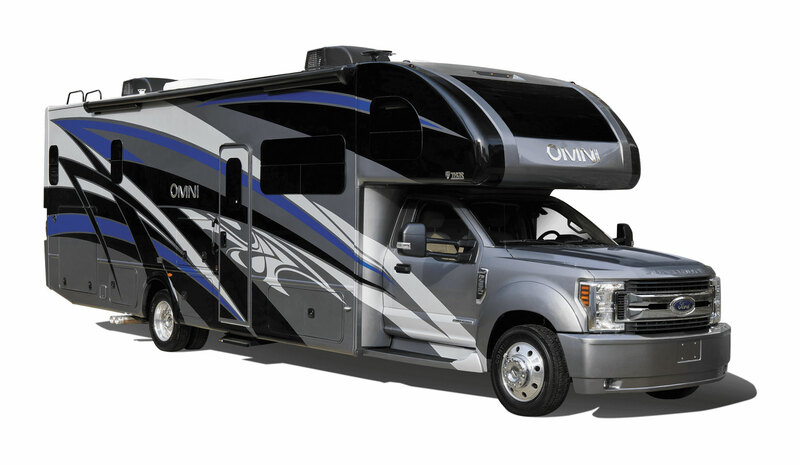 Thor Motor Coach’s Omni “Super C” motorhome is built on the Ford F-550 diesel chassis. During the Florida RV SuperShow in January, Thor Motor Coach unveiled its new Magnitude and Omni “Super C” motorhomes for the first time to the public. The units are built on the Ford F-550 chassis, powered by the PowerStroke 6.7-liter diesel engine, and equipped with a lane-departure warning system. Features include a panoramic skylight with an accompanying Sky Shade, above what Thor officials bill as the largest overhead bunk available in an RV. These Super C motorhomes were named a 2019 Top RV Debut by RVBusiness magazine. Thor rolled out more than a dozen new floor plans during this and other winter RV shows. For more information, call (800) 860-5658 or visit www.thormotorcoach.com. 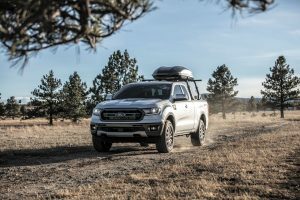 The Ranger pickup truck, reintroduced by Ford in 2019 after an eight-year absence, is the focus of a “Tough Has More Fun” advertising campaign aimed at outdoor adventurists. The 4×4 Ranger is flat-towable behind a motorhome. Ford has targeted outdoor adventurists in ad campaigns for the flat-towable Ranger pickup. Ford partnered with Outside TV on the television, social media, and in-cinema campaign, which spotlights 15 professional adventure athletes using the Ranger to get to their activities, including BASE jumping and snow surfing. In addition to national advertising, some spots are specifically tailored for certain cities: Boston, Massachusetts; Los Angeles, California; Denver, Colorado; Phoenix, Arizona; and Seattle, Washington.